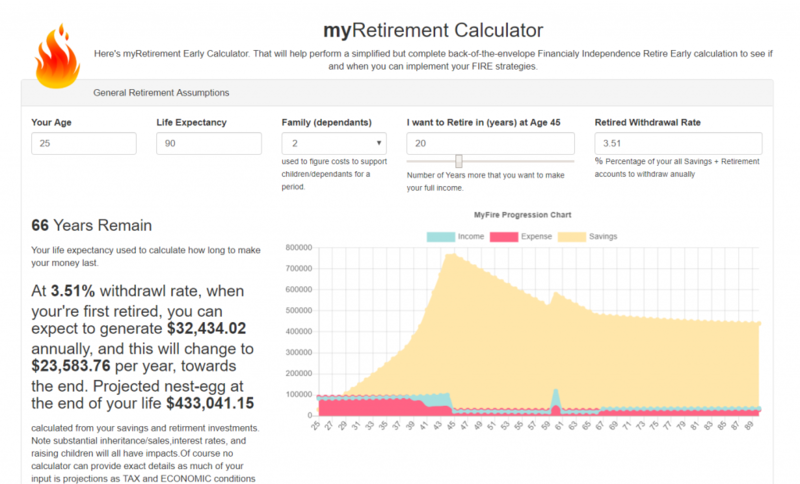 my Retirement calculator – can you retire now? I decided to create a modern, easy to use and practical on-line retirement calculator, and I open-sourced it too! There are ton’s of these available all over the internet, but none really quite had enough details or the specific details I wanted to make them useful. So I approached this retirement calculator from the FIRE ( Financially Independent Retire Early) perspective , where you’re goal is to save as much as possible , then after a certain number of years, you can retire and live off your savings and investments and misc. income. I tried to take into account all the major factors affecting your earnings and expenses for the retirement years, incomes, savings, retirement, kids, housing, healthcare, taxes , inflation etc.. While this calculator is geared with the Fire philosophy, its still just a standard retirement calculator and can apply to virtually anyone. Yes, this is a USA-centric calculator, many of the assumptions and projections are based on living in the USA. Some other countries may be close enough and the projects should still be good enough, but there’s a balance between a very generic calculator for the world and a very specific USA one I think I found a happy medium. The Calculator – Try it out. So the basic Calculation model works, very simply. I like simple things. On the other side we have your EXPENSES . Expenses are more linear over your lifetime, income taxes are calculated based on 2018-2019 tax bracket, and applied to against your annual income. Housing expenses have a term if you’re a home owner, with a separate field for perpetual costs like property taxes, insurance, maintenance etc. The number of dependents count as an expense, based on current pricing models of how much it costs to raise a child to 18. The other expense are pretty self-explanatory, adjust the default values to better suit your particular circumstances. // any money left over place in savings for that year. if ( (+work_years+1)==i )  //Show first and last year how much retirement income we get. There are a few one-time events, such as inheritance or sale (of a primary residence or business) which you choose how much and at what time point it occurs. Also Social Security you decide when to take it. If you have a pension , annual pension disbursements begin when social security begins. Code for inheritance looks like this. This is a USA- centric retirement calculator. If you live in another part of the work, your income taxes , social security , inflation rates, currency exchange rates (relative to USD) ,healthcare, interest rates, and other economic/legally conditions will all be different. So if you really want this calculator for your particular region and you know a little web programming (or know someone who does) you can have them modify the code to meet your requirements. Surplus income applied to savings: I applied all annual surplus or deficits to your savings only , not retirement accounts, again for simplification purposes, a more complete model may split-the income gained between savings and retirement, but applying it to the less APY earning is a more conservative approach, plus it also simplifies tax accounting issues (10% penalty before 59.5 years in the US ) with early withdrawals of retirement accounts. Interest calculations compound annually: I assumed interest calculations are compounded annually, again, to simplify the model and daily vs. weekly vs. annual compound interest generally are insignificant in terms of income. Married (household): I assume the income and expense numbers are for a household, so a single income-earner or married income earners, are both contributing to the income, so single or married does not affect expense, this may or may not be true but is situation dependent. Early Retirement Withdraws: There are two buckets for savings, and retirement accounts and savings accounts this was mostly done to have short-term savings and long-term savings rates with different APY. When computing withdrawal rates of say 4% it is applied equally to Savings and Retirement to give you what you can get from your combined accounts. I also did not take into account thee 59.5 age rule for non-penalty retirement withdraws, again to simply calculations. Required Minimal Disbursements (RMB): in the US you need to begin withdrawing from most retirements accounts by age 70, there’s a calculation as to what your RMD is . I neglected this to simplify retirement withdrawal calculations and a precise calculation for this would be complex and very much based on you particular circumstances on an account by account level. Kids college tuition, was not included because; not everyone has kids, not all kids go to college and those that do may get a blend of scholarships , grants , military reimbursement etc. to help defer their costs. As an approximation , you can simply add a portion of what you want to save for there collegiate education to your annual discretionary expense . Medicare insurance / Long Term Care: I simplified the healthcare expense as a static annual recurring cost for your entire lifetime. For most Americans (there goes that USA centric thing again) at age 65 you’re eligible for Medicare health insurance. Again consider this as a conservative approach and you can always put those unused Healthcare expenses into HealthCare Savings Account. or also apply these on-going healthcare costs towards LTC insurance, to help defer possible long-term care costs . Inflation: I applied the inflation rate to the sum of all the expenses , inflation percentage is based off CPI. Tax Brackets: I used a simple , married filing jointly tax brackets, again modeling the entire tax code and all its variables is not practical . But this is a conservative approach as it over-estimates tax due for singles. Estate Planning: This is a complex topic and not practical to model in a retirement calculator. But if the calculator show a large nestegg (> $1.5mln) consider estate planning. Food, Utilities, Energy Expense: I used some common defaults based on government or other agency statistics, adjust them to suit your situation. Debt: I had forgotten about this one, but not I added a Debt column and payoff years, to better help model it for those folks that have incurred large amounts of student debt or car loans or any other kind of debt (except mortgage, that has its own field). Life is not linear, and many things can happen over a lifetime to throw all these projections in the toilet. Situations such recessions, job loss, divorce, health crisis, disability, tax changes, unexpected inheritance, etc.. all will greatly affect your retirement plans especially the earlier they happen in your life. Again its not possible to account for all this. This is an open-sourced calculator, feel free to grab the code yourself, or propose any changes or enhancements over at my GitHub Repository. This calculator runs entirely in your’re web browser, its uses the following web technologies. Keeping it simple , yet at the same time modern looking and attractive. I choose to keep the technologies as simple as possible. I’m aware some techies and web developers may pooh-pooh these simplistic technologies, and why didn’t I write this in Angular or React or Vue (btw I would have chosen VUE.js) ?, but my rationale was that because I wanted to make this as accessible and easily modifiable by other folks, I wanted to give the broadest possible access to anyone , even those who aren’t super-technical can just go to my Github clone the page, and begin making edits to the calculation model easy peasy.. I also used external CDN links to the above supporting libraries, and keep the entire code in one index.html page, again trying to keep everything self-contained and compact. You can of course download the supporting libraries if you need to run this completely off-line. Anyways for more technical details and conversation head over to my GitHub repository. This uses a BSD-License, pretty much is free to use permissive license, simply give credit and link back to the original author..
As mentioned earlier, my inspiration for this project, was the FIRE movement, and the notion that if you start early enough , live on much less than you make, and save for tomorrow, you may actually escape the rat race a lot earlier than you expect, and enjoy life the real golden years of your life with family and friends. Remember no one ever says on their deathbed, “Boy I wish I had worked longer in my cubicle farm, “. So this is may small contribution to help use run those numbers with a few key details, and I think this is a decent start. Let me know.. I don’t understand the retirement vs. savings, if you’re only adding surplus income to savings how does the retirement grow..